Like its nearest neighbors Georgia and North Carolina, South Carolina has adopted a very conservative stance towards real money gambling expansion. In fact, the Palmetto State is so traditional that just the mention of state regulated real cash Texas Hold’em poker and other Internet gambling games would probably be enough to set its officials into a tizzy. No, the prospects of legit iGaming and real money Internet poker ever being regulated under SC law are pretty dim. Now, that doesn’t mean Internet gambling and betting games like Texas Hold’em poker online will never reach the citizens of Columbia, Charleston and Myrtle Beach. It’s just that several factors will have to line up perfectly before any progress is made with regard to lawful online gambling on real money poker websites. 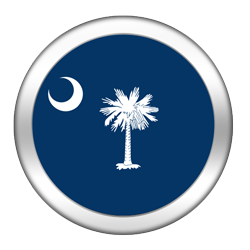 As of today, it is our opinion that South Carolina is currently one of the five U.S states least likely to regulate online poker and other legal Internet betting games in the foreseeable future. Finding a real money US poker site can be a challenge if you’re in The Palmetto State. Lucky for you, we’ve found the best poker websites for South Carolina gamblers. 2 Can Players from South Carolina Play Online Poker? 4 Is Online Poker Legal in South Carolina? In late 2013, a rare sign of life in South Carolina’s otherwise stagnant gambling culture presented itself. A poll was sent out to the SC State’s registered voters asking for their opinion on a variety of topics, including casino gambling, video poker and the lottery . Focusing on whether citizens think it’s fair for state officials to ban private sector gambling, yet still run a statewide lottery, the poll’s presence is a firm indicator that at least some of South Carolina’s residents favor the idea of legalized gambling and games such as Texas Hold’em poker. Unfortunately, Republican Governor Nikki Haley is morally opposed to the idea. So much so, that her personal objections supersede her willingness to create 10,000 new jobs via the construction of a brick and mortar casino. That’s a shame, especially considering that since the end of 2013, South Carolina’s unemployment rate has been higher than the national average . Can Players from South Carolina Play Online Poker? Yes! Despite the state’s vehement stance against regulated gambling, SC residents should have no trouble creating an account and depositing funds onto any of the US poker rooms on our homepage in order to enjoy some exciting Internet poker gambling for real cash. However, players should be warned that South Carolina’s leniency towards online poker betting may change at some point in the future. Our guidelines will be updated to reflect any noteworthy changes. Is Online Poker Legal in South Carolina? There is no state legislature that specifically addresses the legality of online gambling and playing games like Texas Hold’em poker. So, while iGaming will probably never be regulated by the State, it may never be directly outlawed either. With that said, South Carolina’s gambling statues are among the strictest we’ve come across. Currently, due to the state’s outdated gambling statues, the legality of real money online poker and betting on Internet websites resides in a murky gray area, and can be interpreted a number of different ways. Of course, it’s always best to seek professional advice regarding sensitive legal matters, and we encourage you to do so before playing any gambling games online. South Carolina’s gambling statues do not provide a definition of gambling. However, they do explicitly state that any game involving cards of dice (such as Texas Hold’em poker or craps), or any gaming table, in so long as the game takes place at any tavern, inn, store for the retailing of spirituous liquors or in any house used as a place of gaming is unlawful, regardless of whether any wagering takes place. The penalties for participating in unlawful games and betting are imprisonment for a period of not over thirty days and a fine of not over one hundred dollars. The owner of the tavern, inn, retail store, public place or house used as a place of gaming is subject to much harsher penalties, including twelve months in prison and a two thousand dollar fine. Section 16-19-40. In keeping with its Bible belt traditions, South Carolina’s gambling laws ban any game from being played on the Sabbath (Sunday). The penalty for breaking the law is fifty dollars. Section 16-19-70. Betting on elections is considered a misdemeanor. Upon being convicted, guilty parties shall be fined a sum not exceeding five hundred dollars and be imprisoned not exceeding one month. Section 16-19-90. Merely keeping a gaming table for playing Texas Hold’em Poker or any other betting game at one’s home is worthy of a $200 – $500 fine. There is no mention of the words, Internet, computer or online anywhere in South Carolina’s gambling laws. As clearly evident, SC, at least in theory, takes the issue of gambling very seriously. However, it also seems as though the statues haven’t been updated in decades, and are probably not a reflection of the SC State’s current stance. To read more about South Carolina’s gambling laws , refer to the “References” section. Accounts of gambling in the Palmetto State date back to the late 1700s. During the state’s early days, its inhabitants would actively gamble on the results of dog fights, wrestling, boxing, horse races and other competitive sports. Laws were enforced to prevent such activities in the 1800s, but it wasn’t until the mid 20th century that law enforcements agencies really began to crack down on gambling activities, particularly games like Texas Hold’em and other variants of poker. In the 1970s and 1980s, establishments began installing video slot machines. Owners cleverly circumvented the law by paying winners out directly with real cash, as opposed to the machines. A 1991 Supreme Court ruling deemed that businesses that conducted gambling affairs in this manner did not break the law. However, by 2000 the Supreme Court found all video gambling machines unconstitutional. Shortly thereafter, nearly 33,000 gambling machines such as video poker machines were removed or disabled. Ironically, that same year, South Carolina voters elected to support a statewide lottery. The first lottery ticket was sold a year later, and the lottery remains a staple of South Carolina’s lawful betting and gambling culture to this day. In 2011, law enforcement agencies seized over $2 million from two companies accused of transferring funds to online real cash poker players. The companies in question were also accused of money laundering, fraud and for violating the UIGEA. There aren’t many. South Carolina does not permit any form of poker games or gambling outside of the legal state lottery and charitable bingo. Indian and commercial casinos are prohibited, as is any form of pari-mutuel betting. Playing poker in a home, even if no real money or rake is involved, is considered illegal. Horseracing, casino nights and slot machines are also banned. Considering that South Carolina’s powers have just begun to play with the idea of legalized gambling, it’s safe to assume that online wagering and Internet poker will not be regulated by the state any time soon, especially if anti-gambling proponent Nikki Haley remains in a position of power. If you’re a poker player in South Carolina, you’ll have a solid choice of quality online poker rooms from which to choose. In early 2012, a proposal to open a resort casino in Hardeeville, SC, was brought before state legislators. Fearing that a casino would negatively impact tourism to Hilton Head, most state officials opposed the idea. Leading the anti-casino charge was Governor Nikki Haley, who ever since her election in 2010 made it very clear that she will not support the construction of a casino. Without her approval, it’s very unlikely that the resort will be permitted until at least early 2015 . In other news, the state’s only federally recognized Indian tribe, the Catawba, has been fighting to open a gambling facility within its York County reservation. However, to date, they’ve had little luck securing approval from government officials. In a surprise turn of events, South Carolinian officials approved a bill that would allow local governments to regulate casino cruise ships. The bill was passed in 2005, and since that time, thousands of South Carolina’s residents have set sail from one of the state’s many docks to play Las Vegas-style real money gambling games such as Blackjack, Roulette and Craps . South Carolina’s repressive gambling laws are beginning to come under fire. In 2012, the state’s Supreme Court ruled that poker (Texas Hold’em, etc.) was a game of skill . Furthermore, the video gaming machines that were banned in 2000 are making a comeback, this time as sweepstakes machines. Given enough pressure, state officials may be forced to lighten their anti-gambling position, maybe even enough to finally approve an Indian or commercial casino that would be able to offer games like legal real cash poker and other casino games. While this still doesn’t mean iGaming and playing poker on Internet websites will be regulated by the state any time soon, it does provide citizens with a spark of hope – but only a spark. The reality is that until the Federal government steps in and passes a bill that regulates online poker betting throughout the United States, it’s unlikely that South Carolina will even address the matter.